I think most people would be able to relate to Sheng Siong because they’ve probably seen it around or shopped in it before. It’s quite surprising how people show little interest to things they see or visit every other day. I thought it would be quite interesting to look into Sheng Siong’s business since I buy my favourite sweets there from time to time. Initially I didn’t think much of Sheng Siong until I actually dug down into its financials. On hindsight, what surprises me is how Sheng Siong consistently escapes my filtering process, missing out on such a great business for so long. Sheng Siong belongs to a class of resilient business irregardless of the business cycle because it is a provider of food and groceries. Even if the market crashes, you still need to eat wouldn’t you? As such, I believe that Sheng Siong as a business will not go away, and the fact that they have become well-rooted in Singapore already. As of 2015, there are 39 Sheng Siong supermarkets situated all over Singapore. 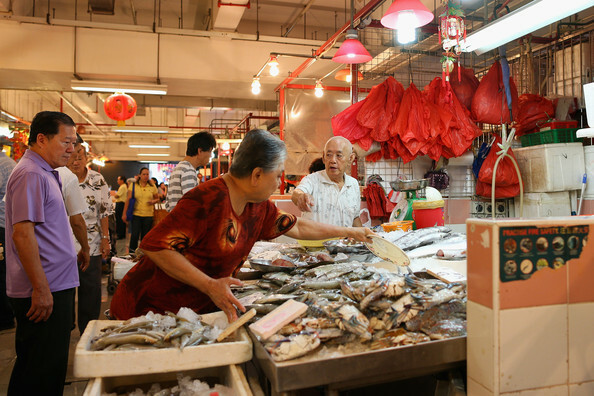 With upgrading works in Singapore, we might possibly see the typical wet markets removed completely and replaced with supermarkets like Sheng Siong as we progress in time. I don’t know about you, but I would much prefer to have a Sheng Siong kind of ‘wet market’ than to have the typical one in my neighbourhood as I feel it’s cleaner and more comfortable to shop at. One thing I enjoy about Sheng Siong is that it is basically self-sustaining and growing without the need for debt. But no debt alone means nothing. Why I felt Sheng Siong was a great company is because of its FCF. I like that I can expect higher Cashflow from Operating Activity as Sheng Siong grows and expands while CAPEX will remain and grow at a sustainable pace, providing us with more FCF as the years go by. FCF numbers alone mean nothing, but what it means is that the management has more options available to them. They can pay out more in dividends, which they are already doing. (92.6% of Net Profit in 2015) Or pursue growth projects with higher Internal Rate of Return (IRR) to improve earnings. Continue to expand existing business through upgrades. Conduct share buybacks. (Only to be done if management is sure the stock is undervalued) Basically, it’s extra money for Sheng Siong to do what is beneficial for the business and the shareholders. There isn’t much product differentiation between Sheng Siong’s products and its competitors like Fairprice and Giant. Everyone is selling the same thing and it’s just a fight between who sells at a cheaper price. Which brings me to Point 2, Lack of Brand Loyalty. Because it’s all about having a low price, it doesn’t matter to me who I shop from. If my neighbourhood has a Sheng Siong, I will just shop there. If my neighbourhood has a Fairprice or Giant, I will shop there. To me, all 3 supermarkets give me the impression that their products are cheap and there’s a marginal difference in terms of price between the 3. I wouldn’t make the deliberate effort to travel down to another neighbourhood just to shop at Fairprice or Giant if Sheng Siong is just right around the corner, vice-versa. The expansion of Singapore with new BTOs around is a good sign for Sheng Siong because where there is new population, there is a need for a supermarket to conduct grocery shopping. Take for example, Fernvale is a relatively new area for BTO after Punggol. And in 2015, Sheng Siong was the highest bidder for a HDB shop at Fernvale. Bidadari next? As long as new area keeps opening up for residency, new opportunities for Sheng Siong will arise. Fresh products generally give Sheng Siong a higher gross profit margin of >30% while non-fresh products stand at around 20% margin. Sheng Siong’s product mix stands at approximately 40% fresh vs 60% non-fresh. Couple this with bulk purchasing and economies of scale, we can see more room to grow in terms of gross profit margins. Also, with the growing labour cost, Sheng Siong’s management has been quick to take action to introduce self-checkout queues in some of their shops to reduce the need to hire so many employees, reducing cost and increasing profits. Additionally, the government gives Sheng Siong grants for productivity projects, wages and special employment credit schemes. It’s comforting to know that the government is helping Sheng Siong to buffer against the rising cost of labour! A dollar saved is a dollar earned. This might be the start of many things to come in Sheng Siong’s venture into China. However, let’s not be overly optimistic just because it’s in China where the population is huge. Global competitors, way bigger than Singapore’s competition has already set foot there. Think Wal-Mart, Carrefour, and Metro. But nonetheless, we remain excited to see how this venture turns out. It’s refreshing to see Sheng Siong, a home brand pitting itself against the likes of bigger competitors on foreign ground. It’s a fact that Sheng Siong isn’t the biggest player around in Singapore. In fact, it’s 3rd place in terms of market share. NTUC Fairprice and Dairy Farm, it’s 2 main competitors are also pretty aggressive in getting retail spaces, especially in shopping malls. However, it seems like Sheng Siong isn’t going to fight head-on with its competitors. I get the impression that they are more concerned with strategically locating themselves deep within the heart of housing estates compared to shopping malls where Sheng Siong’s competitors are more frequently located. Over the years, Sheng Siong has been able to stand its ground rather successfully and I believe that it will continue to do so in the years to come. Therefore, although its competitors are large, they don’t seem much of a threat to Sheng Siong as they do not seem to have the intent to monopolise the market. Everyone is just employing different strategies to co-exist ‘harmoniously’. Overall, I like Sheng Siong because it’s a boring business that is simple to understand. It possesses a strong financial position and have a lot of free cashflow to play around with. The Founders (All with a substantial stake in the company) have been in the business for about 30 years now and the business is just not going to change much. What’s left now is to leverage on technology to maximise efficiency and to improve margins. Sheng Siong, All For You! Thanks for yr comprehensive covering of SS LTD but fr their financial report I got for the cash flows from operating activities for the year of 2016 is $12,841m instead of $73473. Can u explain why? $73473 represents 2015’s number, taken from 2015 Annual Report. Hope that helps! Do you happen to do a SWOT analysis of NTUC Fairprice? Hoping I could use it for reference! Thank you for the suggestion! I will look into doing one up for NTUC Fairprice when I re-look into the supermarket scene in Singapore! Good analysis however it us not complete as it does not have the valuation section. How do you value this business? Should the investing criteria be a growth company or should it be dividends play? Thank you for your kind words! I actually did a valuation analysis separately but I wanted to leave readers the opportunity to find out what the company is worth without influencing their opinions too much. I valued the business by its growth prospects and did some financial modelling. On whether the investing criteria be growth or dividends, that’s largely your decision! Two people can buy the same company for a different reason! I bought it on growth and valuation reasons for Sheng Siong. Are we able to use your SWOT analysis on Sheng Siong for reference for a school project? We found your analysis very useful.